For Falk, who taught Gadiel to use a hammer on the first day of the Habitat for Humanity project to build their home in Mesa, those words resonated more than he could have imagined. 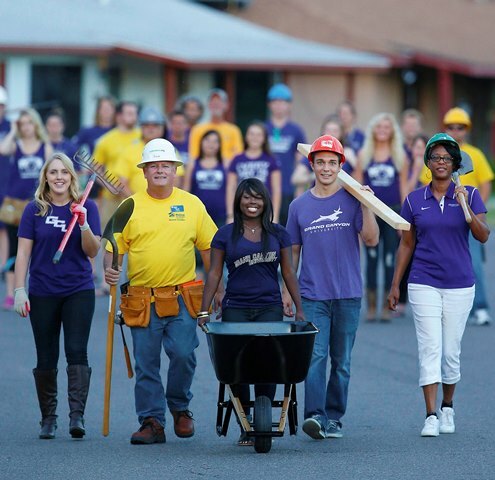 Habitat for Humanity leaders (center) are joined by purple volunteers from GCU in a one-of-a-kind partnership to renovate homes in the community. Vanessa Garcia, a 27-year-old administrative assistant at GCU, had a similar encounter at her first Habitat experience five years ago. Garcia and Falk have been hooked on Habitat ever since those initial experiences. So when GCU announced it was embarking on a first-of-its-kind partnership with Habitat for Humanity to revitalize an entire community of homes in its neighborhood over the next five years, they were among the first to sign up. Falk and Garcia aren’t unique when it comes to community outreach at GCU. Thousands of students and employees volunteer every year at more than 120 outreach projects in which GCU is involved. But this year, those efforts have taken on even greater meaning. The Habitat partnership is part of GCU’s broader five-point plan to revitalize the surrounding community, make neighborhoods safer, create jobs, develop a STEM workforce and support K-12 education. Beginning in January, as part of the University’s five-point plan to revitalize the community, GCU staff and students will work with Habitat for Humanity leaders. Habitat for Humanity, a nonprofit Christian housing ministry, builds and repairs houses all over the world. The partnership with GCU, however, is unique in its scope and is one Habitat hopes to replicate with partners in other areas. In Phase I of the project, the University plans to raise $700,000 to repair homes in the neighborhood just south of the campus in west Phoenix. That is expected to take one to two years before the partnership expands to three more phases in other areas surrounding the University. GCU employees will help finance the project through contributions to a state tax-credit program. Employees and students also will pair with Habitat leaders to supply the manpower necessary to repair the neighborhood homes. Renovations can include landscaping, roof replacement, painting and structural repairs. Garcia said she was attracted to becoming a Habitat volunteer because it’s not a handout but a hand up. Homeowners are required to fund a portion of the improvements and also be involved in contributing sweat-equity hours to the repairs. “We’re not here just to put a Band-Aid on a situation,” Garcia said. “If the homeowners are also involved, it changes their world and makes their lives better themselves. It changes the whole mentality of the neighborhood. Another one-of-a-kind venture is the University’s five-year, $1 million partnership with the Phoenix Police Department. Now in its third year, the Neighborhood Safety Initiative supports Phoenix police crime-suppression efforts in the area from Indian School Road to Bethany Home Road between Interstate 17 and 43rd Avenue. The program funds overtime pay that allows for additional patrol officers in the area to target crime and increase police presence. Claudio Coria, principal at nearby Alhambra High School, has felt the increased police presence. Increased safety is also important to the revitalization of the community from a business standpoint. To further revitalize the neighborhood and attract businesses, GCU has two job-related initiatives in place. First, the University plans to relocate nearly 2,000 employees from its Tempe and Peoria sites to a four-story office complex it will build on GCU land north of Camelback Road between 27th Avenue and Interstate 17. Those employees can shop, dine and buy gas in the immediate area, providing a boost to local businesses, and also will have better access to neighborhood outreach programs. The $30-million project at 27th Avenue also will include a hotel the University recently acquired, a restaurant and a conference center. The second initiative involves working with area pastors and leaders to identify people in the surrounding community who can fill many job openings at GCU, at the hotel and restaurant, and at a University-run golf course. GCU students will have more opportunities in engineering and other STEM-related fields with the launch of the College of Science, Engineering and Technology. At his State of the City address, Phoenix Mayor Greg Stanton stressed the need to develop more college graduates in Arizona — especially in the areas of science, technology, engineering and mathematics (STEM) — in order to develop a better-educated workforce that can stimulate the economy. Phoenix lags below the national average with only 27.7 percent of adults ages 25-34 who have a bachelor’s degree or higher. Compare that to San Diego (36 percent), Seattle (39.4), Austin, Texas (40.8), and Denver (42.2). What’s more, an estimated 1.2 million STEM jobs will be available in Arizona by 2018, yet its universities are producing just half the number of graduates needed to fill this demand. States like Texas, which has more than 100 public and private four-year institutions of higher education, are attracting new businesses because of the large number of STEM graduates they can produce. In an effort to close the Arizona gap, GCU reached out to local industry to help it launch several academic programs in the new College of Science, Engineering and Technology (CSET). The University is developing a comprehensive STEM curriculum with programs in computer science, information technology, information systems, analytics and engineering. The first half of a new 160,000-square-foot CSET classroom and laboratory building along Camelback Road will be open for the 2015-16 school year. GCU student Jesmine Pradhan (right) works with a high school student at the University’s Learning Lounge. Mueller recalled a time a few years ago when he saw several students from Alhambra High School milling around the GCU campus. He approached the group to find out what they were doing. Those students, from an urban area of Phoenix known more for concrete and dirt, are now not only welcome on GCU’s resort-like campus, they have part of a new classroom building they can call home. 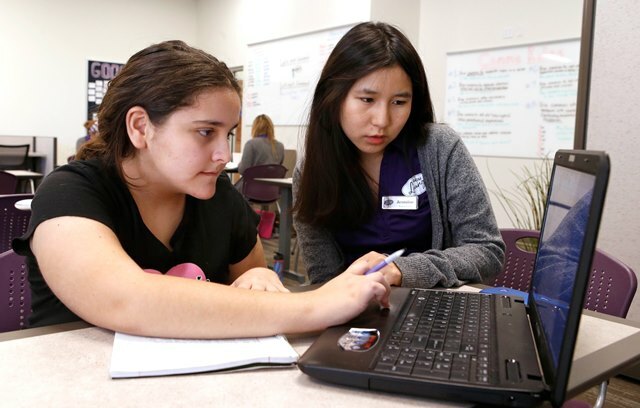 A groundbreaking public-private partnership dubbed the Learning Lounge was launched in 2013 to create a space where Alhambra students can come to campus and receive free tutoring five days a week from some of GCU’s brightest students. The partnership was developed to improve the high school students’ academic performance in core areas of study and also has become a mentoring program in which those students receive college life experience and, for some, realize that they can become the first members of their family to go to college. The Alhambra students, 90 percent of whom fall below the federal poverty level, also get free meals through a partnership with St. Mary’s Food Bank. After just one year, the results have been impressive. Nearly 300 Alhambra students have visited the Learning Lounge and received more than 1,000 hours of tutoring. Alhambra, a D-rated school two years ago, is now just 10 points away from being a B school and leads the Phoenix Union High School District in geometry scores and passing grades in math classes. Students from nearby Maryvale and Bourgade high schools also are visiting the Learning Lounge. Contact Bob Romantic at 602-639-7611 or bob.romantic.@gcu.edu. The most recent partnership with Habitat for Humanity is just one more reason that I appreciate the fact I chose to gain a advanced education with GCU. I love being a student at GCU and these opportunities confirm my decision of coming here. These outside partnerships not only bless the community but also provides opportunities for young leaders to develop the character qualities and skills for building future networks and better social and human service systems in coummunities throughout the world. This is truly an unprecedented practical adventure and journey that helps build purpose thre a practical hands-on process of helping others. Keep up the good work and Kudos to our University President and CEO.